The name Candytuft does not come from the American word ‘Candy’ but relates to the former name of Iraklion on the Island of Crete. Annual Candytuft (Iberis Umbellata) is a wonderful flower to grow from seed…some say it is too chintzy…I have never found it to be so…in fact I find it a rather cheeky little number. Not anywhere as tall as most of the flowers I grow but this suits itself admirably to a small arrangement in a glass on the bed side table. It will fill the room with a wonderful scent and make you want to sing songs about kittens and brown paper parcels. This shortness (About 25 cm) has another advantage..in that it won’t take long to flower…I’ve had them flower in eight weeks from a mid April sowing. 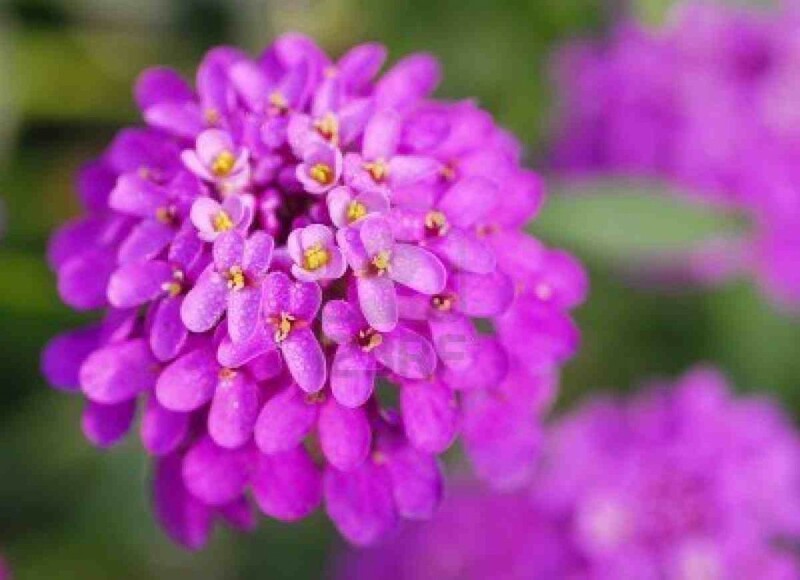 How To Grow Annual Candytuft from seed. Annual Candytuft is easy to grow from seed. *First of all buy yourself the best Candytuft seeds from yours truly. I recommend Candytuft, ‘Crown’. *You can sow in September and/or in Spring. 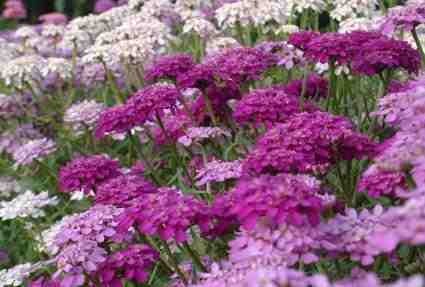 *Candytuft won’t tolerate shade so make sure your flower bed is in full sun. *As usual make sure your bed is weed free and the soil prepared to a fine tilth. *I find it best to sow direct into the soil and not to start them off in pots…they don’t like root disturbance. *I sow in straight lines in my cut flower patch…I make a shallow drill of about 3 mm…prewater this drill before putting your seeds in…then cover over with dry soil…this soil will be warm and will incubate your seeds…and all will be well in Candytuft land. *Thin out seedlings when they are a couple of inches high to a spacing of six inches or so. *Candytuft is suited to a range of soil types but it is never a bad thing to dig in some organic material before sowing to improve your soil structure. If this post was useful..perhaps you may like to read about how to grow Cerinthe or perhaps Eschscholzia. Flowers For Part Shade. Six Of The Best. Amaranthus Caudatus ‘Red’. This is a great annual, proved to be brilliant for cutting and the seed heads are great in arrangements too. Glad we found it! Just planning September sowings now. Any new kids on the block we should be considering Ben?